Clint Calvin was introduced to disc golf in 2013 when a friend in his hometown of San Diego, Calif., took him to play at Morley Field. His first throw veered a bit off course. "I hit this dude on hole two's teepad, and I felt really bad," Calvin said. "I was like, ‘I don't know if I should keep playing,' and my friend was like, ‘No, you're good. You're good.'" Disc golf was a natural fit for the avid hiker, and he had gotten a taste for competition through lacrosse and other sports. He was hooked from the start but played casually for the first few years of his disc golf tenure. A switch flipped in 2016 as media coverage within the sport had exploded. YouTube was a hub of tournament coverage and instructional videos. "That's when I discovered all of the resources that were available to me," Calvin said. "They put in a course called Mast Park, and that's where I started to put in a lot of field work and dialed my game in. That, and Sun Valley. My whole day for the past two years has been devoted to nothing but disc golf and improving my game. I've been doing nothing other than working and playing disc golf for the past two years. It's been a lot of putting and field work and workouts. It's a constant process." The hard work paid off in a big way as he crossed paths with Core Team member Seppo Paju in 2017 when the pair played all three rounds of a tournament together. "I still have the first scorecard from the first round where I beat Seppo framed on my wall and I will forever," Calvin said with a laugh. "I haven't beaten him since, but it's got to happen someday. After the Daniel Boe Memorial this year, Seppo talked to me afterward and gave me an H1 and M2 to try out. Those two discs sold me on Prodigy." Calvin then headed to Milford, Mich., to take on the famed Toboggan course at the 2018 PDGA United States Amateur Disc Golf Championship. He got to the course a day after his friends and got the rundown of all the trouble spots and learned it was an intimidating place to play. "That definitely played a big factor into how I approached each tee shot," Calvin said. "I don't think I ever threw over 70 percent power the whole tournament. I just wanted to keep throwing shots that I knew I could consistently throw every single time. That's something Seppo taught me. I threw the same disc, same shots all three rounds and maintained consistency and that was one of the most important things." Calvin's approach kept him in position throughout the tournament. He started the final round in a three-way tie for second, two strokes off the lead. He fought off the nerves and turned in the hot round, a 1015-rated effort to bring home the title in his first Major. Facing a 20-foot putt for the win, Calvin took advantage of his cushion and laid up for a drop-in. "It still didn't feel real until I got back to San Diego," he said. "Looking down at my PA-3 — I'm holding it right now — I've put so much work in with this putter, and that feeling of being able to drop in for a win, I've never been able to do that. Nothing of this scale. It still almost doesn't feel real. I never thought disc golf would take me to these places. I hoped that it would and wanted to work hard so it would. I'm finally making steps in right direction." Calvin returned home and reconnected with Paju, who set him up with some more Prodigy discs and helped welcome him to the team. "I'm fortunate that Seppo took time out of his day to talk to me, give me discs, and educate me," Calvin said. "I'm very excited to be a part of Team Prodigy. It's made me want to work harder and catch up to guys like Seppo. I can see Prodigy expanding here on the West Coast, and I want to be an influencing factor in that." 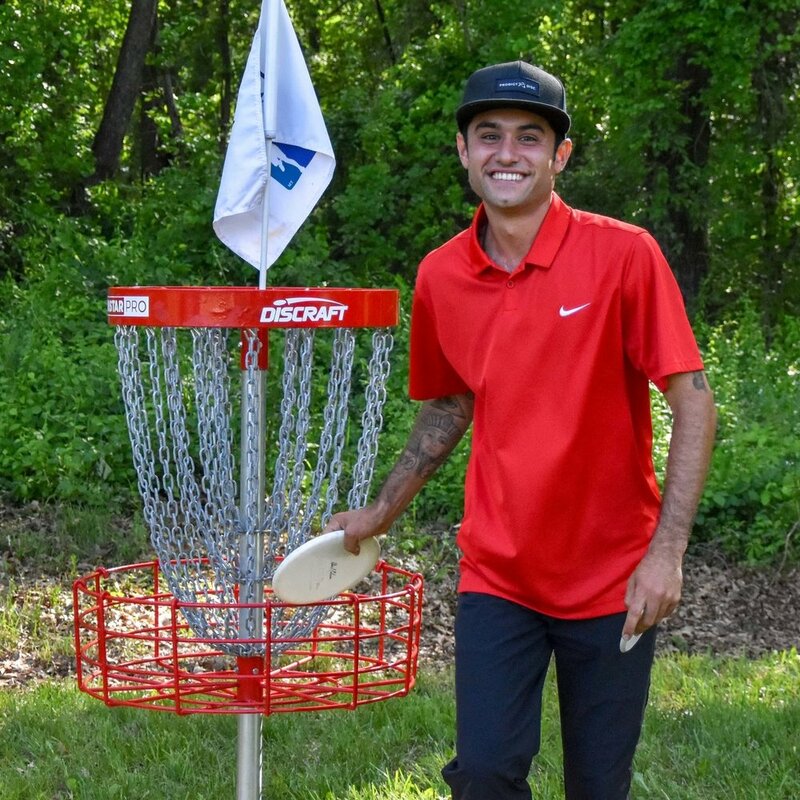 Calvin said he hopes to spend the rest of the season playing in as many sanctioned events as possible to get a feel for his new discs and maintain his confidence before pursuing his goal of hitting the road as a professional disc golfer.